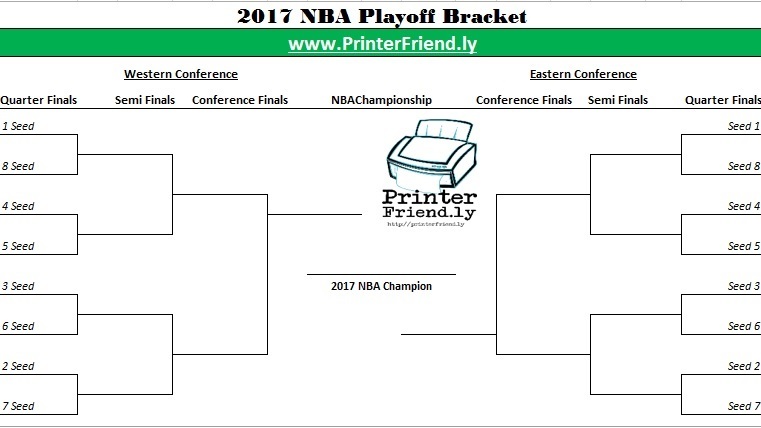 The free, printable 2017 NBA Playoff bracket is now available for fans to use to follow the action during the regular and postseason. NBA fans are excited to see if we will see yet another rematch between the Cavaliers and Warriors, or if some of the other teams in the league will make the jump to earn a trip to the NBA Finals. The 2017 edition of the playoffs will get started in mid-April once the regular season games are wrapped up and the final seeds are set. Until then, you can do your own bracketology in order to best predict which of your favorite teams may face each other in the NBA postseason. Enjoy! You can now get the free, printable 2017 NBA Playoff bracket in both image format above and here in PDF format. We provide the schedule for fans to follow the action and better enjoy the regular season play. Let’s play some basketball! !